Ships today if you order in the next 4 hours 43 minutes. We don't often think about how important our bones are. But that skeleton is literally what keeps us standing strong. 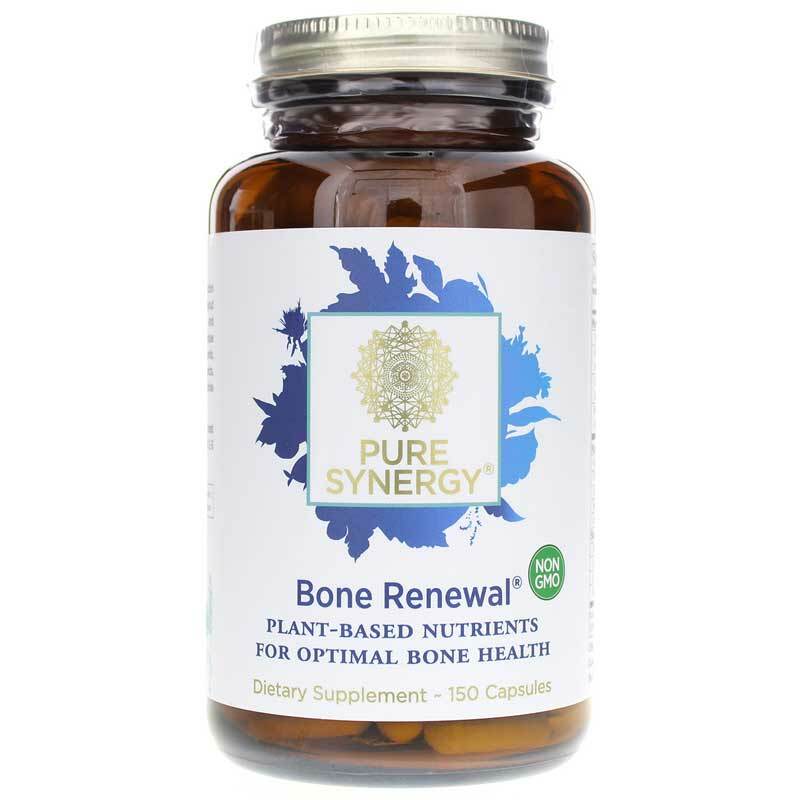 Pure Synergy developed its exclusive formula for Bone Renewal using plant-based, bio-organic ingredients. These ingredients partner with your body's natural ability to maintain the health of your bones. Your bones are the strongest at around 30 years of age, after that they may begin to weaken. Failing to maintain healthy bone mass could result in being more prone to fractures. Pure Synergy spent more than a decade making and refining Bone Renewal. 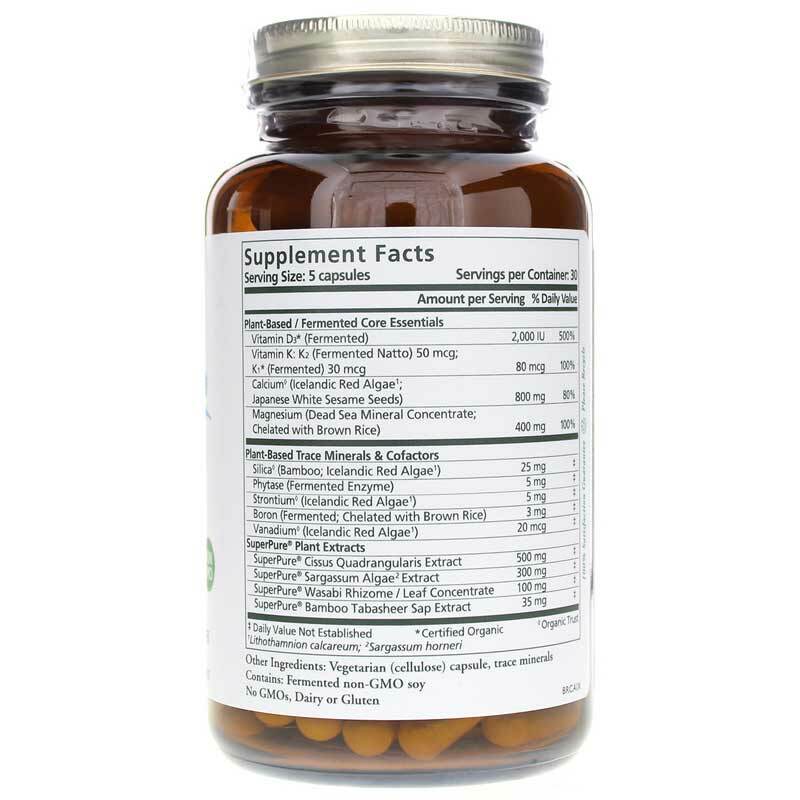 It's designed to support your body's natural capability to restore bones through self-regeneration. Healthy bones will replace 10% of their mass annually. Calcium and magnesium are two minerals everyone needs for proper regeneration of healthy bones. They are the foundation of support for your skeletal system. The calcium and magnesium in Bone Renewal are chosen for purity and superior bioavailablity. Pure Synergy provides these minerals in a perfect 2:1 ratio in order to optimize bone health. You'll also find three important vitamins: organically grown vitamin D and vitamin K1 as well as natto-based vitamin K2. While core minerals supply the foundational building blocks, other key nutrients in Bone Renewal are also essential to the natural process of maintaining healthy bones. Bio-organic cofactors such as silica, phytase enzyme, boron blend as well as plant-based strontium and vanadium maintain health and support regeneration. The combination of these botanicals with essential core minerals and co-factors could compound the possible benefits of Bone Renewal. Stay strong your whole life long with bones that are supported with all-natural health. Other Ingredients: trace minerals, vegetable cellulose (capsule). Contains fermented soy. Contains NO: gluten, dairy, additives or GMOs. Adults: 5 capsules daily: 2 with breakfast and 3 with dinner. So far I'm only able to take 1 tablet. When I take more than that I get cramping. I'm going to stick with them because I know the Pure Synegy products are good! 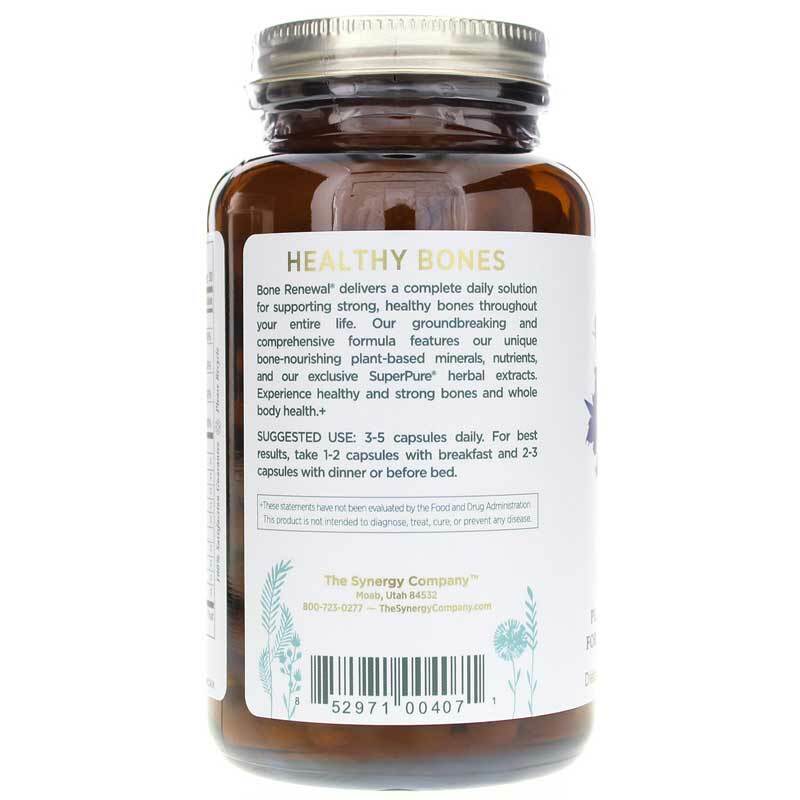 This product is well crafted and blended to give a well rounded supply of minerals to the body for rebuilding and maintaining bone integrity. Highly bioavailable! I even take less than the recommended amount. These were recommended by my naturopath. I appreciate all the nutritional value. Great source! I really feel the diffrence with this product. I just feel my body really absorbing and using every little mineral. Bone Renewal's great! Its Organic! I just started taking Bone Renewal; only on the first jar. I've been taking calcium supplements forever and always on the lookout for "the best." I have a friend who does a lot of research and I trust her and this is what she said and why I am using Bone Renewal now: "A recommendation from someone I trust very much. She likes Bone Renewal better than [fill in the blank; don't want to bash another company}.....more bio-availability." So on that alone, I ordered Bone Renewal. This Calcium supplement is complete with Vit D3 and K2, plus others, so I dont have to buy a lot of other supplements. Im always looking to get the best calcium + magnesium + necessary vitamins. My nails are stronger as well! Ive been taking Bone Renewal for over a year and highly recommend it. And the capsules are easy to swallow, which is also important for me. We love this product. We take it at less than the recommended dose as we take other supplements with similar ingredients. This stuff is great though, with all Synergy products, I feel absorption is much higher than other alternatives. I love the fact that I can use a whole food supplement rather than a "lab concoction"
This is the best calcium supplement I have ever come across. Highly recommended! This is a wonderful product and vitamin D and much more in one capsule. Ordering from this site is also wonderful and fast! This product was also recommended by my naturopath doc. I have been using Bone Renewal for several years..... I follow a vegan, whole foods, dairy free, diet so I am grateful for a whole foods product that supplements the calcium from natural food sources..... I use several other products from The Synergy Company. I find there is a commitment on the part of the company for the highest quality products for health and well being. I appreciate that Naturally Healthy Concepts has chosen to make these products available. Great product! Lowest price I've been able to find online, plus free shipping. I will reorder!